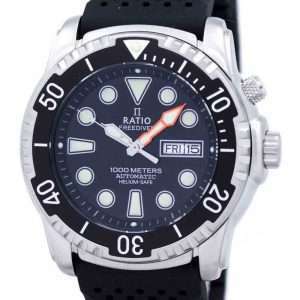 The Ratio 1038EF102V Diver, surprisingly, is intended both for recreational and professional use. 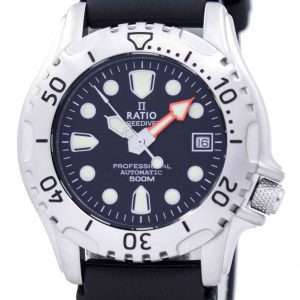 It is well-equipped to stand saturation environments and shares some of the innovative Seiko creations for divers and adventurers and currently under use, globally. 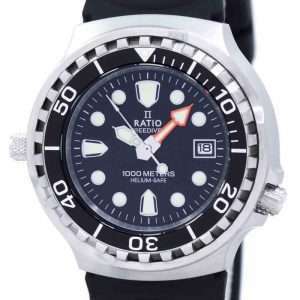 This gents’ 1000M diver’s watch is fitted with a helium valve and the SEIKO VX4E date-quartz analog movement. 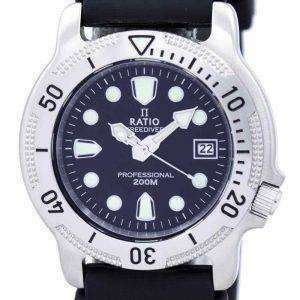 The black dial has the logo RATIO upon it along with the symbol while the red-border minutes-hand is visible to the max! 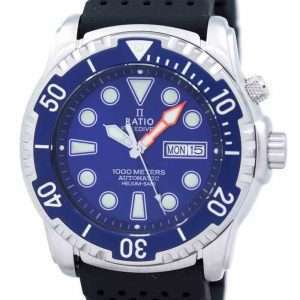 Topped with a sapphire crystal, the Ratio 1038EF102V Diver gets you many of the things that are usually available in the higher price brackets. 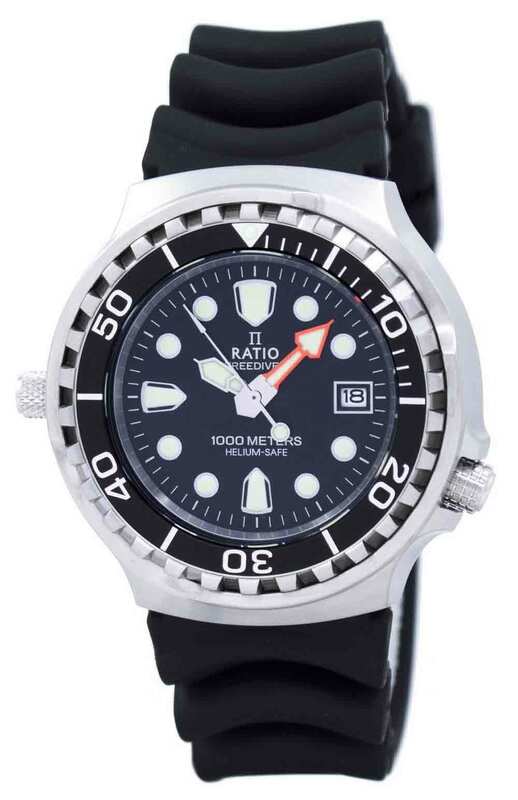 The Helium valve in the Ratio 1038EF102V Diver was Seiko’s answer to the damages created to the watches when you are saturation diving. Even in diving capsules. The 1000m concept is from Seiko. It uses a Seiko movement. 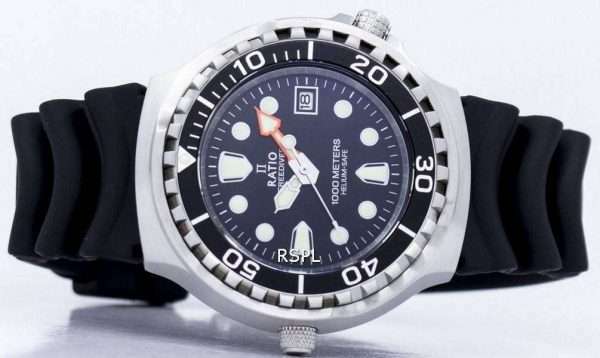 Just like its inspiration, the Ratio 1038EF102V Diver is made to withstand diverse situations and harsh environments and is quite worthy of a praise. 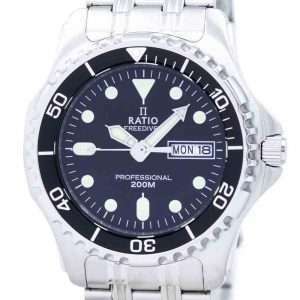 The Ratio 1038EF102V Divers’ watch has significant protection against Helium, a constant issue for saturation divers. 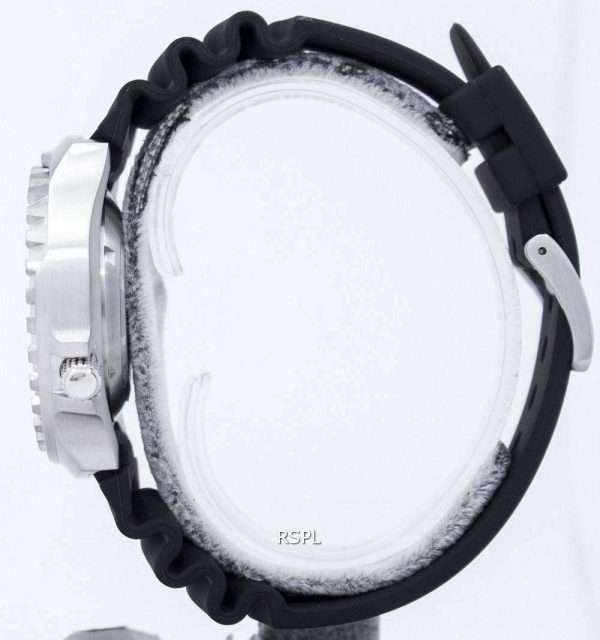 The gas can penetrate the glass along the edge where it meets the watch case. It increases internal pressure and can burst it open. So – the Helium-escape valve! Opening it releases the accumulated Helium back into the atmosphere. This Helium comes from the Trimix, which is breathing gas comprising oxygen, helium and nitrogen. 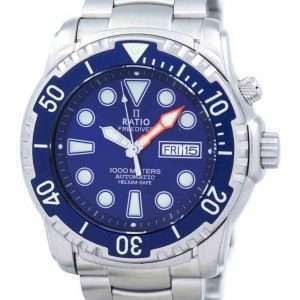 It’s used during the deep phase of dives, both fortechnical diving and advanced-recreational. The machined surface of the watch case is fantastic. The brushed finish is fine, making its great tool-like design look even better! The serrated bezel is well-done; it is 60-clicks unidirectional. The clicks have a firm and satisfying feel to them and the lume-dot at 12 adds to its overall night-visibility. The screw-down crown at 3 and a screw down helium valve at 2, each comes with distinctively different machined-finishes. It increases the grip, especially so under wet conditions. 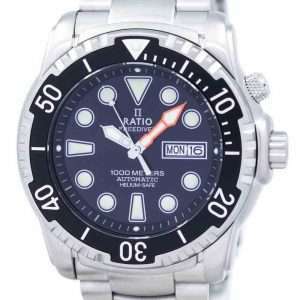 Powering the Ratio 1038EF102V Diver is a Seiko Epson VX42E, Japan-made quartz movement. This is a basic, workhorse quartz movement with no jewels, but immensely popular for its strong, simple build and accurate timekeeping. Never lags or races more than 10 seconds a month. 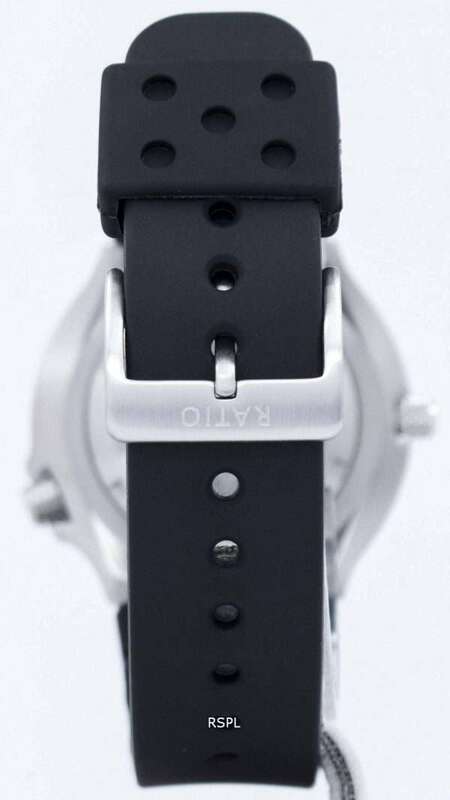 The perforated, polyurethane black dive strap is very comfortable. There’s plenty of space for air to circulate and not let sweat build up. 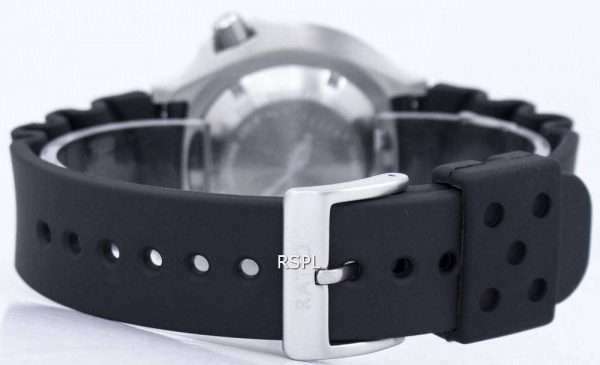 Its solid stainless steel buckle is unique; cool too. The lumed and chromed, rocket shaped hands are prominent time-markers; hard to miss. 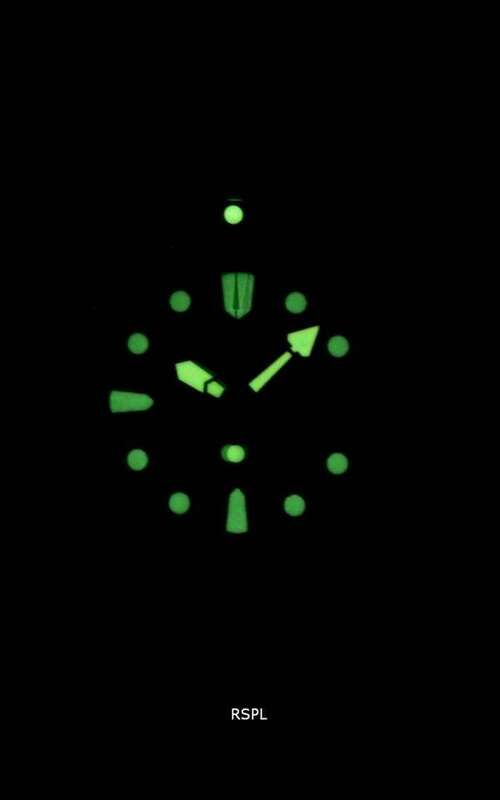 The lume is excellent with a glow for near-to 8 hours. Do you need a watch with a helium-release valve when the max you make it is to the nearby seaside tourist spot? 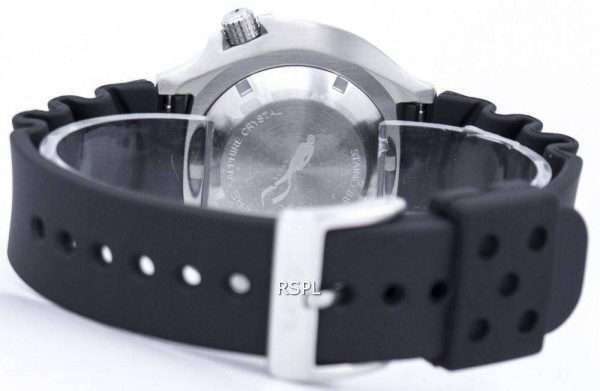 You might be extremely tempted to answer with a firm “no” but oh, would you question your needs for many of the features and complications you crave in mechanical watches? So maybe, a “Why not?” sounds better.